How are godly women to win their disobedient husband? By being in subjection to them without a word while they (their husbands) behold your chaste conversation coupled with fear (1 Peter 3:2). This “coupled with fear” stood out to me recently so I went to the commentaries to figure out what this meant. Most husbands can only dream of having a wife who feared them in this way! Unfortunately, the majority of wives today have no desire to fulfill their husband’s “conjugal rights” or allow him to be the “authority” in their homes. What are conjugal or marriage rights? Conjugal rights would include not depriving their husbands of sexual intimacy since this is a strong need that the majority of men have and their wives are commanded to fulfill it according to the Word. It also includes treating their husbands with respect and reverence. Wives are to be their husband’s help meet and take good care of their children and home as well. Godly wives will want to do these things for their husbands and do their best to obey their husbands in everything! Included in this list of conjugal rights of a husband as a godly wife, would be to build her home up instead of tearing it down with her own hands. Part of building her home up would be pursuing peace within her home. Most husbands don’t want to fight with their wives. They also want well-disciplined children who are pleasurable to be around. 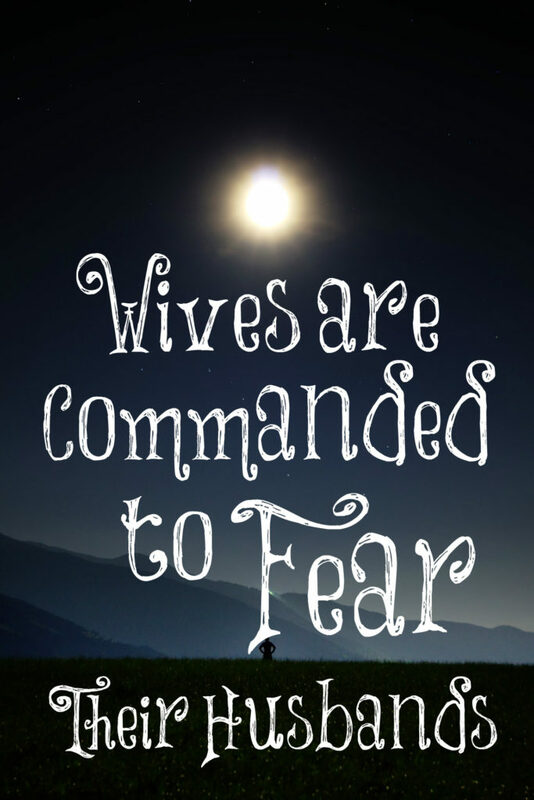 Ultimately women, we will one day answer to God for how we treat our husbands for when we reverence and fear our husbands, we are showing reverence and fear towards God. Knowing this, we won’t argue with our husbands because when we are arguing, we are showing disrespect and are usurping our husband’s God-given authority over us. We need to be agreeing with them a lot more than we are disagreeing. If we disagree, we state our opinion once and then let it go. Hammering them over the head with our opinions all of the time is not showing them the respect they deserve. Women of the world today are incredibly noisy. They want to be known, their voices heard, and their wants fulfilled. They march for godless principles, watch ungodly shows, and speak filth. This is opposite of what the Lord wants from us. We are to be known for having meek and quiet spirits. We rest in the Lord’s will and are at peace, not fighting for what we want but living out godly values instead. We trust the Lord to handle things so our faith becomes strong and we pray continually. Godly wives only seek the best for their husbands and dwell on the good in them. Their hearts are set on pleasing them and making their lives better. They are careful with their own lives and words so they don’t do or say anything that will embarrass them. A wife is her husband’s glory (1 Corinthians 11:7) so her behavior reflects good or badly upon her husband. Just as we trained our children to cheerfully and immediately obey us when they are young, a wife who cheerfully obeys her husband when he asks her to do something brings joy to him just as Sarah obeyed Abraham: Even as Sara obeyed Abraham, calling him lord: whose daughters ye are, as long as ye do well, and are not afraid with any amazement (1 Peter 3:6). Amen, Karla! Truth is what sets us free. A family recently moved into our neighborhood. She shouts constantly at her husband, who shouts back at her. There are small children in the home. I have never witnessed such anger and ugly language. I pray for them daily and have tried to speak to her but she has made clear that she has no interest in friendship. The police have been called several times and it may lead to their eviction. Ladies, do not tear down your own home. Never belittle your husband. Do NOT allow your children to hear you complain about or to your husband. When I find myself growing irritated, I whisper part of Psalm 51 “…..create in me a clean heart, O God, and renew a right spirit within me”. He never ignores my plea; He is faithful and strong when we are weak and weary. You are renewing your mind with truth, Tam, and this is what transforms. Thank you! See that’s the main issue right there “in front of their children”. How can we expect our children to behave a certain way when they watch their parents behave so poorly. When wives have certain expectations of their kids to behave a certain then they should be leading by example. I guess the parallel is this: If mom is constantly arguing with dad then why isn’t it ok for the kids to do the same without consequences??? You’re so right, Rob, and I’m praying for you! I had to laugh a little Rob. Not at your circumstances, but i remember one day i was yelling at my children because their rooms were a pigsty. And then i turned around and saw my room. So convicting. So i kept my mouth shut amd took some of my own medicine. What you say is so true. Or it’s so shuttle when they do it in front of your kids or family and you are more overt. It’s a womanly art of overt disrespect.